book as a birthday present to myself a couple of years ago, it’s brilliant. 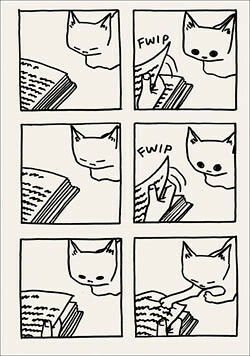 I love the simple style and the classic cat antics in the comics. He has since published another great book, Cats Are Weird: And More Observations which I have as well and both of them are on my shelf of favourite cat books. I might have to treat myself to Cutest Sneeze in the World Postcard Box because it’s just so adorable! If you’re looking for a gift for a cat lover or you want to treat yourself to something cute and funny I definately recommend these books.